However, a few things revealed later in the series (or which are exclusive to the manga, but uncontradicted in the TV series) are referenced in this profile, in order to give it depth. The most notable instance is Rei’s family life and artistic skills. Known Relatives: Father (Estranged), Mother (Deceased), Maternal Grandfather (All Unnamed). 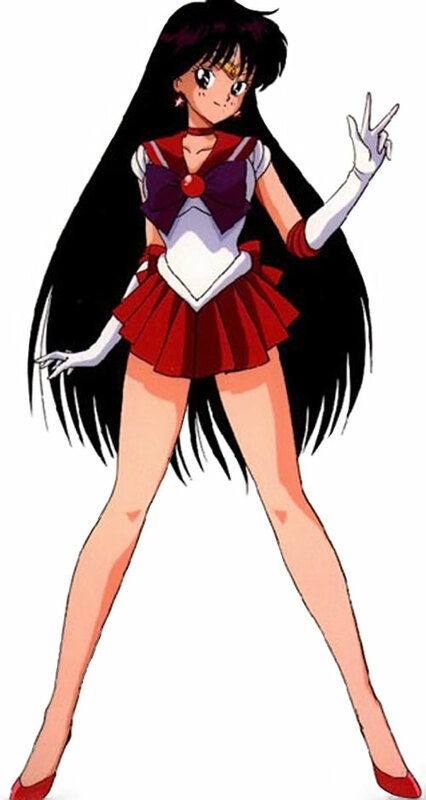 In normal form, Rei Hino is a very athletic teenage girl with impressive psychic abilities. She possesses knowledge of several Rituals related to pyromancy (fire-based divination) and battling supernatural creatures. Akuryou Taisan, her most commonly used ritual, freezes an enemy and throws its mind into confusion. She is also a good singer and songwriter. Aside from rituals and religion, Rei is also well-versed in mundane fortunetelling techniques, such as Tarot. She appears to have tamed two crows, Phobos and Deimos, who hang around her a lot when she’s at the shrine. They are very loyal pets, and have risked their lives defending Rei. Aside from being rather intelligent and brave for birds, they seem normal. 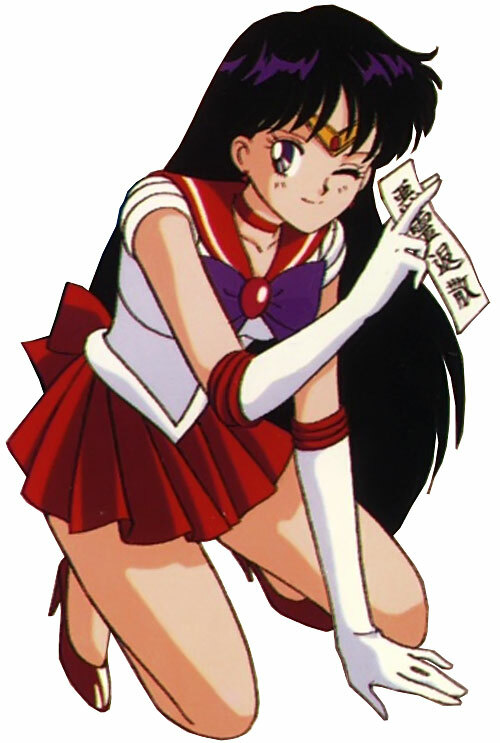 As Sailor Mars, she gains superhuman strength (for a girl her size and age), superhuman agility and toughness, the ability to make superhuman leaps, the ability to give cool intro speeches without getting interrupted (usually), and a signature attack. This signature attack, Fire Soul, is a gout of flame fired from her index fingers. It should be noted that the Senshi Team Attack quite a bit, combining each other’s signature attacks for greater effect. As a young child, Rei saw little of her father, a politician, and a rather cold and distant man. One day, while waiting for him to come home from a trip, her mother, a physically and emotionally fragile woman, died. Given the choice, young Rei (who hated her father, and blamed him for her mother’s death) decided to live with her maternal grandfather, a Shinto priest, at Hikawa shrine. Her father still sends her a great deal of money, however, and pays for her to attend the prestigious Thomas Aquinas Academy. Appearances have to be maintained, after all. One day Jadeite, Dark Kingdom general, came up with one of his typically haphazard plans to obtain human energy for his master, using Hikawa and its famous love charms as bait to capture young women. Disguising himself as a normal human, he got a part-time job at the shrine, and, with a youma (demon) posing as a bus driver, kidnapped scores of schoolgirls in order to drain their energy. Rei had never entirely trusted this new employee, and always felt uneasy around him. But she didn’t quite connect him to the evil presence she sensed was behind the disappearances of the shrinegoers. Day after day she performed rituals before the shrine’s sacred fire, trying to determine what the cause was, but Jadeite’s great power appears to have obscured him from view. This led Rei to doubt her powers. One day, Usagi Tsukino (aka Sailor Moon) and her friends visited the shrine in order to buy love charms. As 3 other girls were leaving, Jadeite hit them with dark energy. Rei, sensing this and thinking it came from Usagi, performed Akuryou Taisan, knocking Usagi out. After Usagi recovered, an embarrassed Rei confided her newfound doubts about her fortunetelling abilities. This caught the attention of Luna, Usagi’s guardian cat. The feline believed this charismatic, psychic girl might be the Moon Princess she and the Senshi were seeking. Noticing a lot of schoolgirls at the shrine, Luna felt there might be an attack. She got Usagi to call her friend Ami (Sailor Mercury), and the friends went to the bus stop near the shrine. When the six o’ clock bus pulled up, Usagi fearfully refused to board it. While Ami were trying to convince her to do so, it disappeared before their eyes, taking its passengers with it. The next day, Usagi visited Rei, telling her she’d seen the bus disappear. Rei took offense, believing Usagi was accusing her and her grandfather of kidnapping the girls, and angrily ordered her to go away. Usagi did, promising to return the next day. Luna left a transformation pen behind, and Rei curiously picked it up. Afterward, Luna and Usagi (after a good deal of convincing, and disguising herself as a bus stewardess), boarded the six o’ clock bus. They were transported into a strange alternate dimension, with Ami arriving too late to help them. While this was going on, Rei was performing a ritual before the shrine’s sacred fire. She sought the source of the evil which seemed to be plaguing them. Rei finally succeeded, seeing Jadeite’s image. When she confronted him, he abandoned all pretense of humanity and threw the girl into a dimensional hole. This sent her right into the hands of the youma bus driver, who began choking her. 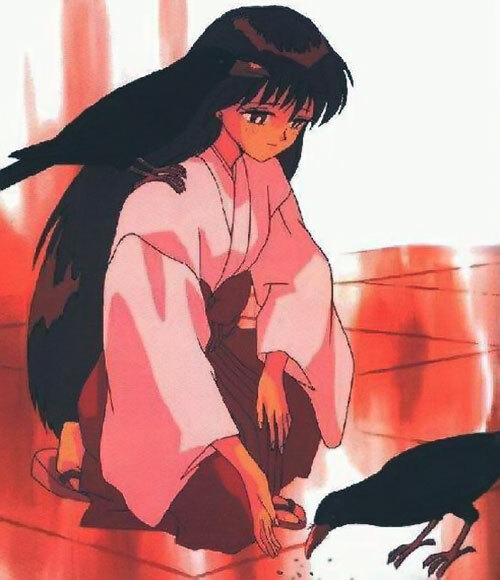 Rei’s crows, who had also been transported into the alternate dimension, attacked the youma, allowing Rei to escape its grasp. Sailor Moon used her tiara to ensnare the youma (probably not wishing to attack it while it was in such close proximity to Rei), while Luna urged Rei to transform into Sailor Mars. Using her Fire Soul attack (and probably pumping a great deal of Hero Points into it) Rei incinerated the youma. But the power of her attack also caused the dimensional hole to begin closing. On the other side, Ami fervently hoped and prayed for the safety of her friends, somehow causing her Transformation Pen to send out a beacon of light. It shone through the dimensional hole and showed Moon and Mars the way home. Tuxedo Kamen also showed up, having tied the floating buses full of kidnapped girls together, and drove the Senshi home. Mars reflected that Tuxedo Kamen seemed very cool, and made a crack about how Sailor Moon’s love for him was obviously unrequited, sending her into a flood of tears. Sailor Mars would prove instrumental in finally defeating Jadeite. This happened when the Dark Kingdom general, on thin ice with his master Queen Beryl due to the numerous failures of his plans, confronted the Senshi directly. He threatened to turn Tōkyō into a sea of fire if the Senshi didn’t go to Tōkyō Airport and fight him. At first he had the upper hand. He discovered the Senshi’s secret identities and terrorized them with simulacrums in the shape of humans and telekinetically-controlled airplanes. But his sexist insults and mockery soon united the previously-bickering girls against him. Mars used her Akuryou Taisan ritual to freeze him in place, while the others attacked. Addled by the mystical technique, Jadeite’s confused mind turned its own telekinesis against him, causing him to be run over by an airplane. Jadeite managed to overcome his confusion enough to teleport into Beryl’s presence, where the cruel monarch froze him in a block of crystal. The general died with the true names of the Senshi on his lips. During the Rainbow Crystal saga, Rei would discover that her grandfather was the carrier of the Indigo Crystal, and the reincarnation of the Great Youma Jinji. After Zoicite pulled the Crystal out of him he briefly became a youma, but was restored to humanity by Sailor Moon. Mars fought alongside the other Senshi until she met her end during their siege on the Dark Kingdom’s base at D point in the Arctic. She was the last of the Senshi to fall to the youma group known as the “DD Girls”. Before she died, she made a tremendous effort and killed off the last of them, so that Usagi could reach the Dark Kingdom’s base unimpeded. 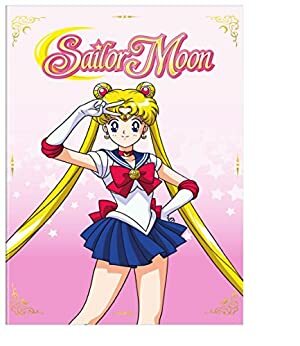 When Sailor Moon used the Silver Crystal to defeat Queen Beryl/Metallia, restore herself, the Senshi and Tuxedo Kamen to life, and to remove all memory of the Dark Kingdom from humanity’s memory, Rei was able to re-assume the life of a normal teenage girl. Rei is a strikingly attractive teenage girl with a great deal of presence, particularly when dressed in her Shinto robes. Yuuichiro fell in love with her at first sight, and her looks combined with her confident attitude and personal charisma have won her many admirers, both male and female, at her school. When not wearing Shinto robes or the Thomas Aquinas school uniform, Rei usually wears the latest in teen fashion. 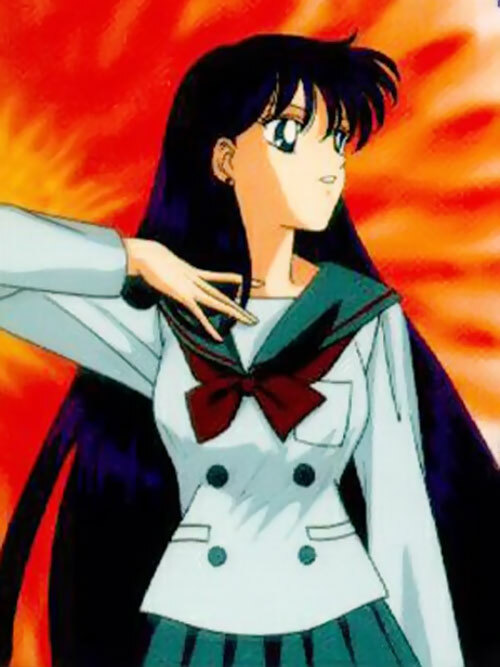 As Sailor Mars, she wears a sailor fuku with a short red skirt and purple bows on her chest and lower back. She also wears a red choker, red high-heeled shoes, and white elbow gloves with red elbow pads. Red star-shaped earrings and a tiara with a red jewel complete the outfit. 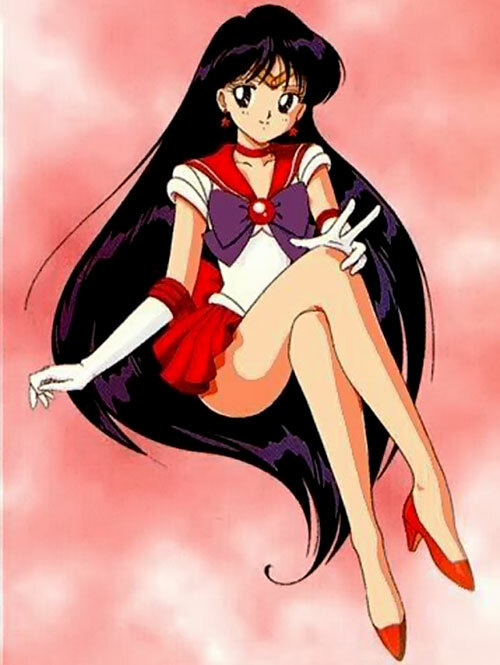 Rei Hino is a highly spiritual, confident, strong-willed person. Unfortunately, like many such people, Rei can be inflexible, short-tempered, stubborn, and very outspoken about her opinions. She often browbeats people into going along with her ideas. She is very proud, as well. While she would like to believe she’s a cut above her peers in maturity and tries to act it, she’s really not much better than the average teenage girl, getting giddy over boys and such, and occasionally succumbing to child-like behavior. Usagi is a very easy target. Less insightful people might think, watching the two of them, that they hate each other. However, they’re actually very close friends, and trust each other deeply. Rei only criticizes Usagi because she honestly wants to see Usagi achieve her full potential. For her part, Usagi thinks so highly of Rei that she’s entrusted her with the Moon Stick and Silver Crystal, should anything happen to her. Rei is greatly embarrassed by her somewhat lecherous grandfather, who hits on her friends, as well as pretty much any other reasonably attractive person, but she loves him dearly, nonetheless. Since childhood, Rei’s psychic abilities and formidable personality made her something of an isolated figure. The students at Thomas Aquinas hold her in awe, but are also intimidated by her. The Sailor Senshi seem to be the closest friends she’s ever had. As for romance, Rei has a somewhat cynical attitude about men (not as bad as in the manga, though). However she still became infatuated with Tuxedo Kamen and Mamoru Chiba. She briefly dated the latter (rather, she latched onto him and dragged the poor guy out on dates) until it was discovered that he and Usagi were destined lovers, whereupon she let him go graciously, if somewhat regretfully. Lately, a young, rich priest-in-training at the shrine, Yuuichirou, fell for her at first sight. She’s taken an interest in him as well, though she’d never admit it. There are hardly any super heroes in Japan anyway. So the Senshi could be dropped in with few problems, although it would probably be necessary to move the Dark Kingdom’s base out of Superman’s backyard. In a campaign without Sailor Senshi, Rei’s psychic powers would probably make her a member of the DCU mystical community. Perhaps she’s Madame Xanadu’s new card-reader. Confined HQ (Hikawa Shrine), Lightning Reflexes, Local Hero (Tōkyō), Pets (Phobos and Deimos), Rich Friend (Yuuichiro), Rituals (see below) Scholar (Rituals, Shinto, Fortunetelling), Sharp Eye. Her father might qualify as “Rich Family”, but she wants as little to do with him as possible. Alter Ego (Rei Hino (Controllable)), MIA (Bickering with Usagi), MIA (Stubbornness), MIA (Short-temperedness), SIH of her Father, Secret Identity. Confined HQ (Hikawa Shrine), Pets (Phobos and Deimos), Rich Friend (Yuuichiro), Rituals (see below), Scholar (Rituals, Shinto, Fortunetelling), Sharp Eye. Age (Young), Alter Ego (Sailor Mars (Controllable)), MIA (Bickering with Usagi), MIA (Stubbornness), MIA (Short-temperedness), SIH of her father, Secret Identity. Transformation Pen [BODY 01, Insta-change. Allows transformation into Sailor Mars]. OFUDA [BODY 01. Note: Rei can toss these like darts, and they may be parried in midair as such. These serve as necessary components for some of Rei’s Rituals, and she carries a good number of them, concealing them in her clothing]. SIA to protecting Rei, CPR (Birds). Special Restriction: Probability Contol is only for altering games of chance in her favor. Special Restrictions: Broadcast Empath only to cause confusion in target (this may have other effects if the target attempts to use any Powers such as Telekinesis). Ofuda must be placed or thrown upon target. Bonuses & Limitations: Neutralize is Mystically Linked. Special Restriction: Ofuda must be placed or thrown on target. Casting Time: 10 APs (One hour). Special note: Rei automatically used this when her grandfather was transformed into a youma. Looking at him through the fire, she saw an clear image of him pleading for help, in spite of the form he wore. Special note: APs are high because Jadeite was not a direct threat to her or to the universe, when she used this ritual she nonetheless saw a perfect image of him the the fire, which indicates several RAPs. Note: Rei likely knows other Rituals in the soothsaying vein. Remote Sensing seems likely, as does Postcognition. During the season after this, “Sailor Moon R”, Rei is shown unsuccessfully attempting to use her psychic abilities to detect a lost person. It seems likely that she wouldn’t try to do this if she didn’t have any ability to do so, even if it seems to be fairy low-level. Since she doesn’t demonstrate it during this season, it is listed as a speculative note under “Powers”. Hikawa Shrine is listed as a Confined HQ because it seems to be the place there the Senshi meet most, as well as providing Rei’s ofuda, and the fire she uses for pyromancy. 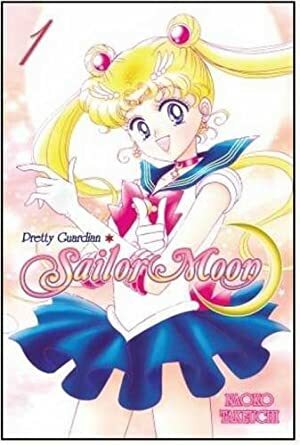 Source of Character: Sailor Moon TV Series (Episodes 1-46).